Easy links to FAFSA official website application, FSA ID, help and more. The official FAFSA site, provided by the US federal Department of Education, is studentaid.ed.gov, but you can also get there from fafsa.gov or fafsa.ed.gov. We have provided links below to the pages of the official FAFSA site to assist you in your student financial aid process. Note: The FAFSA application forms for 2019-2020 and 2018-2019 are available now. We have the printable forms and links to the website below. If you are new to apply for college, you probably are thinking, What does FAFSA stand for? FAFSA stands for Free Application for Federal Student Aid. It is a free form, from the Federal Student Aid office of the U.S. Department of Education. FAFSA is your gateway to be considered for 9 different federal student aid programs such as Federal Pell Grants, over 600 different state aid programs, and most of the institutional aid programs at private and public colleges and universities in the U.S.
FAFSA is also required for consideration to receive financial aid for specific student populations such as athletes, students with dependents, and military and their dependents. The U.S. Department of Education begins accepting the FAFSA applications beginning October 1 of each year for the next fall academic year. Most federal, state, and institutional aid are considered on the basis of first come, first served. Therefore, students should submit their FAFSA applications as early as possible to be considered for maximum financial assistance. Here are the major links to the official FAFSA site, where you can download forms or file your FAFSA online - all for free! Many of the forms are available in both English and Spanish. 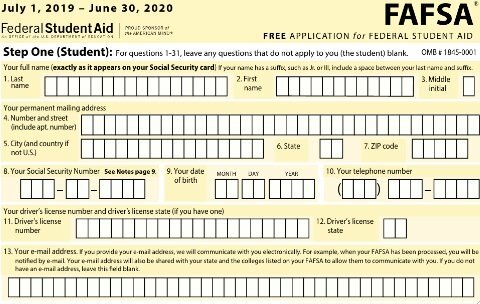 FAFSA.gov offers printable FAFSA forms that you can either fill out on the screen and print the completed form, or print out the blank form to complete the printable FAFSA application. If you don’t have access to the internet or a printer, you can request a paper FAFSA by calling the Federal Student Aid Information Center at 1-800-433-3243. It takes about 3 weeks to process a paper FAFSA, so an online submission is preferred. Over 98% of students submit their FAFSA application online. FAFSA.gov (now studentaid.ed.gov) offers some tips for help with FAFSA applications. Refer to the link below for help from the FAFSA official website. FAFSA4caster tool is an online FAFSA estimator offered by FAFSA.gov. You can enter some basic information, and it will estimate your eligibility for federal financial aid, such as Pell Grants, Work-Study and Direct Stafford Loans. This FAFSA on web worksheet is available online as a pdf. This printable FAFSA form is designed to be used as a FAFSA worksheet to print out and prepare your information before you enter it online. It is sometimes used at college financial aid workshops. One way to get more help with FAFSA is to use the FAFSA Demo tool. This online sample FAFSA form allows you to enter information into online on the FAFSA.gov site, into a demo account. This is the best way to get comfortable with the FAFSA site and FAFSA online app before you use if for your application. At the official FAFSA website, you can complete your application FAFSA free online. This is the preferred method to submit your FAFSA, and it is free from the official FAFSA site.